Latvian Immigrant Innvestor programme may be discontinued after one of the parties in the running coalition called for it to be closed. The main criticism that is levied on the program is that it pushes up the cost of the Real estate in the country and thus makes it difficult for the local people to buy homes. The immigrant investor visa was first implemented in 2010. It allows foreigners who come from outside the European Union to invest in Latvian property and receive a permanent residence permit for Latvia and the European Union. When it was introduced in 2010, some in Latvia credited the scheme with reviving the Latvian property market where prices had been depressed since the financial crisis of 2008. One Riga estate agent, Kristaps Kristopans told the BBC in 2011 business was booming having been ‘completely dead’ before the scheme was opened. 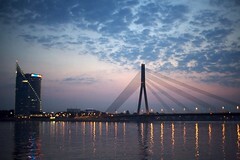 Since the beginning many Latvians have opposed the program out of fear that the real estate price in the capital of Riga may go unreasonably high due to the increased demand from foreigners. In addition to that there were some concerns that too many Russians will be ale to acquire property in the country which is a very sensitive issue for some Latvians due to the fact that it was just before 20 years when Latvia gained independence from Russia and only 12 years after Russian troops finally left Latvia in 1998. Latvia has been controlled by Russia for much of the last 300 years and has been invaded by Russia on several occasions. Many Latvians today still have a strong mistrust of Russians. Robert Zile, who is a Latvian MEP even warned that the program might be used by various Russian criminals in order to gain access to the Euro area.